Tower Grounding Bar Kit: .25 x 6" x 12"
This solid copper ground bar with high conductivity is the primary choice for grounding towers and antennas. 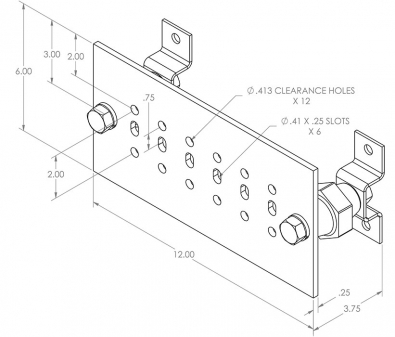 Multiple equally spaced holes and slotted holes for numerous and various grounding accessories. This ground bar’s high ampacity allows for multiple ground connections from the electrical system or applicable to surge protection system. The standoff insulators are made from fiberglass-reinforced thermo-set polyester with higher moisture, heat tolerance, and mechanical strength to enable electrical installers to crank up closer height tolerances, making more suitable for ground bar and perimeter grounding applications. This all in one kit saves installation time and money.